And instantly the woman was made well. ​Have you ever taken that step, into that foggy space you couldn’t see, somehow just knowing He was there, knowing that God was there …. And He was. ​When faith goes from believing to knowing, doing is soon to follow. ​The dictionary classifies the word “faith” as a noun but I would venture that faith – is really a verb. Faith is awesome. Faith is reassuring. For Christians, faith is vital. But faith, as described here is passive, it’s docile, it’s… well, where’s the energy, the movement in this faith? Wow, this poor woman Matthew is telling us about. If we can just chat for a minute ladies – can you imagine her suffering and discomfort? I mean 12 years!? Bless her heart. But Matthew is leaving part of the story out. It’s not just about her suffering from her condition; she also suffered because of her condition. The Jewish people had very strict Old Testament laws and rituals about a woman with her condition. [ref. Lev 15:19-30] She was “unclean”, everything she touched was unclean, and everyone that touched her was unclean. And because of this, she was most likely shamed, shunned and cast out, not only by her peers but very likely even by her family. Faith that believes also sees… hope. She hears about this man, Jesus. This man, that is going around and healing people; lame are walking, blind are seeing. Could these stories be true? Could this man Jesus heal her? And for probably the first time in 12 years she finds something that she had lost... hope. She believed just touching the hem of His garment would heal her. Faith that believes also moves… expectation. If there was going to be a chance to see Him, it was now. He was in her village. She had to go to Him. But she was unclean, He couldn’t possibly touch her to heal her because then He would also become unclean. Could just touching his cloak heal her? And for maybe the first time in many years she goes out in public with... expectation. She came up behind him and touched the fringe of his garment. Faith that believes also receives… restoration. He turned to see her. In that crowd, the noisy begging encroaching crowd, each vying for His attention; He looked right past them and saw her, there at His feet. He knew her. He knew her body’s condition and He knew her heart's condition. He knew her faith. ​Oh sisters, there is such hope for us! Hope in this Son of God. Hope for our healing from years of suffering, hope for our restoration from shame and exile. He is here, He knows each one of us, He knows our circumstances and he knows our hearts. 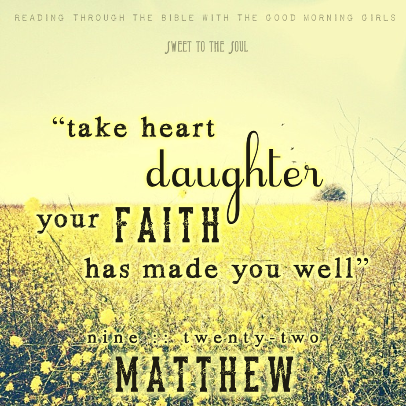 Blogging Through The Bible with Good Morning Girls [Matthew]. over at her place, for #livefreeThursday. Would love for you to join us! I just love your blog and I finally was able to add it to my Bloglovin' blog reader! WOOT WOOT! Yay! thank you for all your support and encouragement Mary. Faith really only is effective when put into action! We walk by faith, not by sight! What a beautiful retelling of this story. It is special to me because my husband and I were inspired by this passage to create a dance we have performed in our dance ministry. Linked up with you at LiveFree Thursday -- hope you'll stop by for a visit! My grandma used to tell me if we all had the faith of a newborn we could move mountains. Newborns trust we are going to care for them, comfort them and love them. Shouldn't we have the save faith with our heavenly Father? Love this post! Yes and amen! That is one of my mantras -- faith is a verb. It encourages me to step out what I believe. Good stuff. Thank you! Visiting from Women Living Well.